Good morning! And happy Monday! Today I have a polish brand that’s new to the blog, but not new to me, Azature. Even though I'd never tried it, I was very familiar with it. Azature is the LA-based luxury jeweler responsible for the most expensive bottle of nail polish in the world. One bottle contains 267-carats of black diamonds and is worth a staggering $250,000! When it was unveiled on Kelly Osbourne's digits at the 2012 Emmy Awards, some people thought it was over-the-top frivolous, but I thought it was genius. It got the entire planet talking about Azature…at a fraction of the price of traditional advertising. Soon after, Azature launched a more consumer friendly polish line. For $25, each bottle of Azature nail polish contains a single black diamond. Today I have a swatch of Azature Red. This polish is gorgeous. It has a deep gem-like sparkle to it that is really stunning. Unfortunately, after three separate swatching sessions, I still couldn't do the polish justice in photos. You'll just have to trust me. The photo below is a rare WPP outdoor shot. Look at those perfectly star-shaped glints of light! I gasped when I downloaded this pic from my camera. That's never happened in one of my pics before. 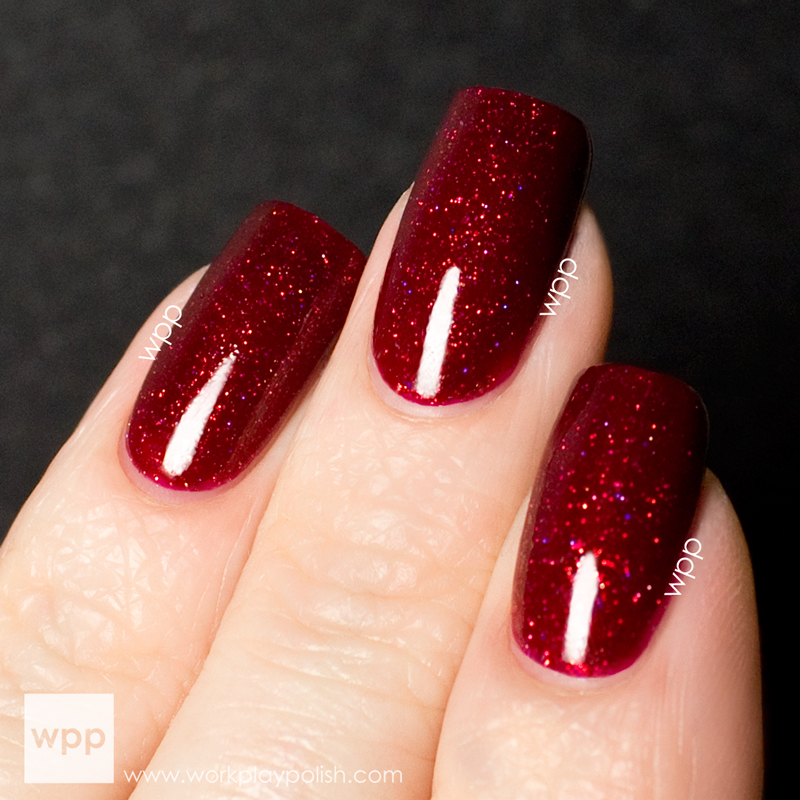 There's so much fine glitter layered in the polish, that the formula is a little thick. Be careful not to overwork it during application. It's also surprisingly opaque. The combination of dense formula and almost powdery glitters gives it a sparkle and depth that's different than a regular glitter polish. I used two coats of Azature Red and two coats of Seche Vite. The photo below was taken in my regular indoor setup. In the last pic, you can see it sparkles even in low light. There are other colors available, including some newer "light diamond" options. I hope they all have a similar finish to the one I showed you here. I have my eye on the Black Diamond Pink! You can find Azature on the web, facebook, twitter and YouTube. The polish can be purchased from Selfridges, Harvey Nichols Saudi Arabia, Ron Robinson, Ron Herman Japan and Kitson.